A simple and convenient way to purchase, manage, and track training for all of your employees. To start a group purchase, select a Course Type. StateFoodSafety Makes Group Training Easy. Make your selection then click Checkout. Complete the checkout process to receive your administrative account, or if you already have an administrative account, complete the checkout process and log in when prompted. Your course vouchers* will be added to your administrative account. Assign them to employees immediately by clicking View My Vouchers or log in to your StateFoodSafety account later to assign vouchers. *A voucher is a code that gives an employee access to a food safety course that was pre-purchased by an employer. Each voucher code is valid for one specific course. 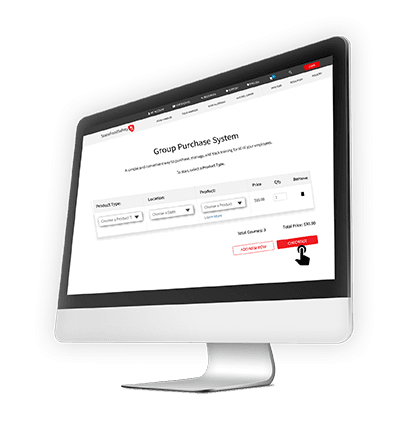 Log in to your administrative account and select the My Group Purchases tab. In the Purchased Vouchers section, click Invite Learner next to the appropriate course voucher. Type in your employee’s email address and click the send icon to email them the voucher code, or click Deliver code in person and follow the instructions to deliver the voucher code in person. Complete the checkout process to receive their pre-paid course. Register for an account as part of the checkout process. Begin training immediately or log in to their StateFoodSafety account later to begin. Complete the training and test. 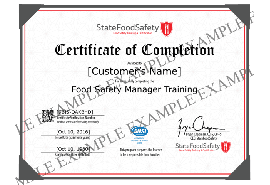 Print Food Handler Card/Certificate of Training. Log in to your administrative account. View all training vouchers purchased through your administrative account in the Purchased Vouchers section. Click Invited to see which employees have received a voucher code. Send reminder emails as needed. Select Redeemed Vouchers to track your employees' progress toward earning their certificates. Choose Certificates to see a list of all employees with an active certificate. View and print employee certificates or sort by expiration date to see who needs to renew soon. What are the benefits of a group purchase? A group purchase allows you to train multiple employees, track their progress, and access all of their certificates. A voucher is a code that gives an employee access to a food safety course that was pre-purchased by an employer. Each voucher code is valid for one specific course. How do employees redeem their vouchers? Click the link in the email sent by the employer regarding their voucher. Manually enter the voucher code on our Redeem Voucher page. Both of these options will add the pre-purchased course to their cart. As they continue through the checkout process, they will need to create their own free account. Why does each employee need their own account? Food handler cards/certificates are generated using the name of the account holder. If an employee completes a course on another person’s account, their certificate will have the wrong name. To protect the integrity of our courses, we cannot make full name changes on a certificate and the employee would have to retake the entire course on their own account. What languages are available for training? Food handler training is available in English, Spanish, Mandarin, Korean, Vietnamese, Tagalog, Serbo-Croatian, and ASL (American Sign Language). Food safety manager training, the Food Protection Manager Certification Exam and Food Allergens Awareness Training are available in English and Spanish. Alcohol server/seller training is available in English.